Montgomery is located in south-central North Carolina and is divided between the Piedmont and the Sandhills regions. It is the site of the Uwharrie National Forest. The county is rural; the closest metropolitan area is the Charlotte region. As of 2011, the non-Hispanic white population is 64%, but the white vote is solid enough for Republicans that Democrats are no longer competitive here, at least on the presidential level. Of interest is the relatively high Hispanic population, 14.5%. The town of Biscoe in particular has a high Hispanic population, at 36%. Former Congressman Larry Kissell is a resident of Biscoe, located in eastern Montgomery County. Prognosis: If the rest of North Carolina were identical to Montgomery County, then Republicans would be in good shape. 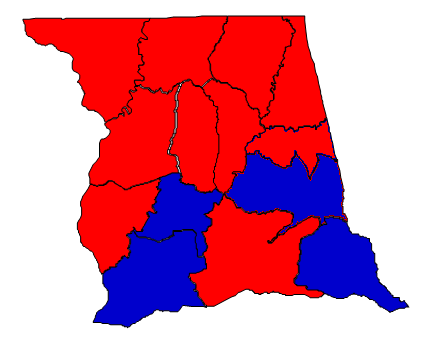 Montgomery has consistently trended to the Republican Party since 1996. White, working-class voters abandoned their traditional place in the Democratic Party and are now more at home with the social conservatism of the Republicans. Montgomery is a very inelastic county. There are almost no swing voters, with solid Democratic and Republican coalitions. The Republican coalition in the county, of course, is much larger. Most Republican candidates end up carrying the county by 10 to 15 points. The Hispanic population of the county bares watching. If Democrats can get these Hispanics registered, then that will certainly help them become more competitive in the county. The bad news for Democrats is that the black population in the county dropped by 10% from 2000 to 2010. If this continues, Hispanic growth alone will not be nearly enough to make the county blue. But with a small population (27,798 residents) and a below average growth rate (3.64%), Montgomery’s role in North Carolina politics is likely to remain trivial.